You do your research. You check out all the different websites that offer tshirt quilts. HOW do you decide on just one t-shirt quilt maker? What do all the terms mean? We will start with many of the most common terms that you should learn about to help you make an informed decision in selecting someone to take care of YOUR valuable t-shirts. Backing - the backside of the quilt/blanket. 100% Cotton - Most desirable. Poly/Cotton blend Flannel- Try to avoid. Usually a very loosely woven fabric. Will shrink a bunch when laundered. Fleece - Try to avoid. Polyester product. This is the 'cheapest' fabric you can use. Used by those who are trying to create a product for the least amount of money and not worried about quality. Binding - This is the last thing that is done to finish the raw edges of the quilt. It is usually the same fabric as the Border or the Backing. Blanket - What non-professionals call their product. Usually, just consists of the t-shirts and a backing of some sort. Be sure to ask what the 'backing' fabric that is being used. Article about difference between a quilt and a blanket delves deeper in the topic. Block - The square of fabric surrounded by sashing. This could be one side of a t-shirt, the front and back combined to one square, or two (or more) shirts combined to make one square. Borders - The strips of fabric that goes around the outside of the quilt. Chaos/Random Quilt - Where the tshirts are cut into random sizes and joined together in a random fashion. Only trust the professionals to do this. Read about Order vs Chaos. Combines - Joining the front and back, appliques, and any other special attention needed to make a block work. Cornerstones - the fabric that goes in the intersections of the sashing. Quilt Shop Quality - This is the highest quality fabric, thread and batting. Costs a bit more, but your quilt will last for generations. Rescue Quilt - Where someone has used a non-professional or the 'cheapest' quilt maker, and then sends it to us to fix. Sashing - The fabric that goes around the t-shirts. Solid Color Fabric - Solid fabric is generally a cost saving fabric. Will highlight the quilting, shows lint, and is not very aesthetically pleasing. Stabilizer/Interfacing – This goes on the back of the t-shirt. This strengthens the shirt, and becomes part of the quilt. Theme Quilt - Where all of the tshirts in the collection have a similar theme such as 'baseball', 'Star Wars', 'Theatre' or 'Harley-Davidson'. The possibilities are endless. Tone on Tone Fabric - Different shades of colors creating 'texture' in the fabric. 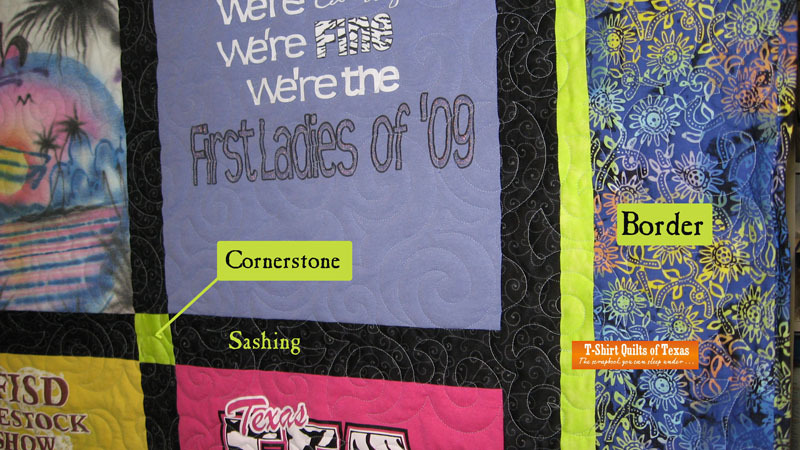 Top - The layer that includes your t-shirts, borders, sashing and cornerstones. Traditional Quilt - this is where the t-shirts are placed in a grid manner. Sashings, borders and cornerstones used to create a familiar ordered quilt. You will hear all sorts of terms and promises about what a t-shirt quilt maker will do. Please do your research and select a quilt-maker who will give you a quality product and not choose the 'cheapest' offer. You want this quilt to last for a lifetime.